At times, simple dates calculation can result in heavy mind exercise. You can easily take help of computer and internet for accurate days – date calculation. 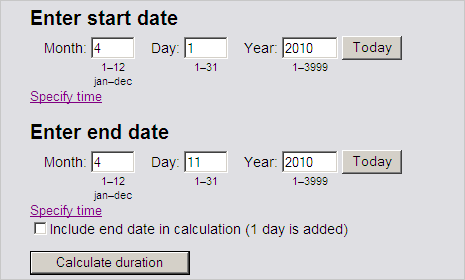 There are number of online and offline ways to calculate number of days between two specific ‘start’ and ‘end’ dates. You can also exclude holidays or specific days for calculation of only working days. 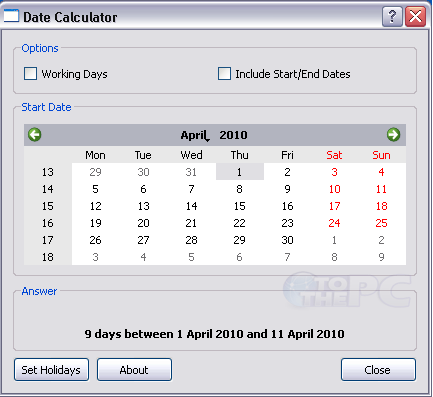 Online date calculator is most easy and quick for calculating number of days between two specified dates. Just select the start & end dates and click ‘calculate duration’ button for exact number of days between two given dates. If you don’t mind installing programs, then download date calculator software. It is a free tool for quick calculation of dates between 2 specified dates. It has easy to use calendar based interface for easy selection of dates. You can even set holidays for exact calculation of working days. you can then subtract a smaller date from a large one easily: remembering that one month is 30 days or so for carrying when dealing with that kind of situation.